Mechatronics is a skill set that integrates electric, hydraulic, pneumatic and mechanical skills, all under computer control. The two-year certification is a gateway to a diverse range of jobs; if you can think of it, we can teach you about it. Ski lifts? We can teach you. Traffic control and lighting? We’ve got classes for it. Underwater robots? Certainly. No matter what piques your interest, we can give you the skills and knowledge to work with it. The Mechatronics curriculum was revised and updated to meet employment demands. There are three Associate Degree concentrations (60 units), five certificate options (18-24 units), and 2 Skills Certificates (< 18 units). In the certificate patterns, a student may choose the option that will meet a particular vocational skill requirement. Patterns are available that provide knowledge and experience in Optical Communications Technology, Linear Electronics Technology, and two levels of Computer Technology. The Computer Technology Concentration for the Associate Degree provides the practical knowledge and experience to install, program, and maintain business computing equipment, or the computer controlled electro-mechanical equipment used for measurement and control during product manufacturing. The Electronics Technology Concentration provides the practical knowledge and experience to troubleshoot and repair electronic analog and digital electronic equipment at the component level. We also have a Mechatronics club in order to provide for you a community among fellow technology enthusiast students. Successful completion of the curriculum in Mechatronics Technology prepares students for positions in businesses and industries that manufacture, utilize, or repair equipment incorporating electronics, mechanics, pneumatics, hydraulics, and programming. Completion of the skills certificate provides students with the underlying principles and hands-on techniques of basic electronics and basic mechanics, thereby preparing them for entry-level electro-mechanical technician positions. Emphasis is on use of electronic test equipment for troubleshooting as well as tools and processes of manufacturing as applied to industrial materials. The Sierra College Robotics Club at RoboGames 2012! 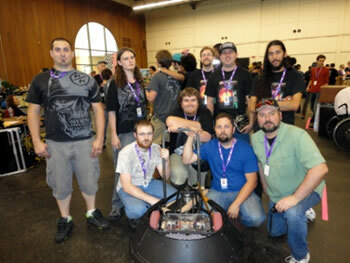 The Sierra College Robotics Club travelled to San Mateo, CA in April 2012 for the annual RoboGames competition. 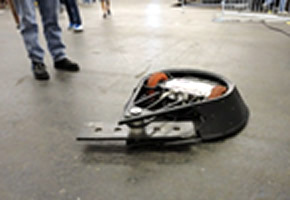 RoboGames is the largest robot competition in the world with over 50 events and competitors from over 20 different countries. (www.robogames.net) Our team, sponsored by the Sierra College Mechatronics and Welding departments, competed in the 120-pound and 220-pound robot-combat competitions (commonly called “battelbot” events). This was our club’s 6th year in attendance at RoboGames and this year we brought two robots, whereas in the past we had only one. We also brought our largest pit crew ever, with nine students getting the opportunity to experience RoboGames firsthand and learn the skills it takes to compete at this high level of technical competition. Students needed to learn about DC motor characteristics, tradeoffs of various battery technologies, properties of various alloys of steel, TIG and MIG welding, radio control technologies, high-reliability electrical construction techniques and many other skills just to get here. They then needed to apply these skills in a situation where any small design or implementation flaw is exploited by your opponent and can mean the end of your robot’s ability to function or even its total destruction. Our brand-new 220-pound bot named “Kick Me” (made mostly out of left-over parts of previous bots to keep the cost down) did fairly well for its first time in the arena. It won one match and lost two, which is typical for a rookie robot. We learned a lot and will apply those lessons to make it even better for next year. Our 120-pound combat bot, “Wolverine”, is in its third year of competitions and did even better, with three wins and two losses. Its good performance and wicked 30-pound spinning blade was also highlighted in a Wired magazine online article entitled “10 Angry Robots You Shouldn’t Let Inside Your Home”. This was a year of experimentation for our 120-pound bot. We were trying a new battery configuration, a new weapon scheme and an improved armor configuration. The best news this year is that we FINALLY solved our battery problems that had caused us to burn up several hundred dollars worth of batteries over the last three years. A small flaw in the construction of our new battery box caused us to lose one of our matches this year, but with that fixed, no burnt-up batteries and valuable data on our weapon performance, we are ready to enter next year’s competition with a design we know will make us an even more serious competitor. Robot competition is a fantastic experience for our students. The lessons they learn in teamwork, communication and task prioritization are something that they will find valuable for the rest of their lives. And the technical knowledge they acquire applies directly to the high-tech industrial careers they are preparing for (except with less sparks, flame and flying metal shards). The best part is that they are learning these things not just because they want to pass a test in school but because they want to build the best robot that they possibly can. This “pulling” of information by the students and getting instant, non-ambiguous results on their efforts is a fantastic way to learn.